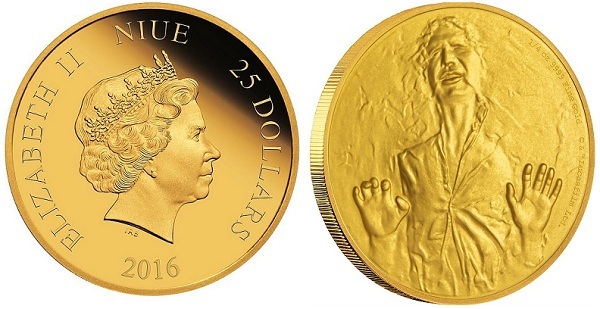 The New Zealand Mint has issued the second character design in its new Star Wars Classic series after featuring Darth Vader on gold and silver coins back in September. 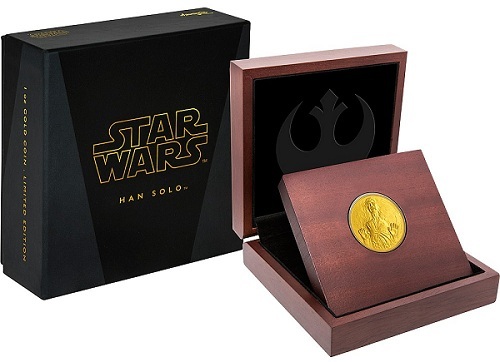 This time, the coins carry an image of Harrison Ford’s Han Solo frozen in carbonite, referencing the famous scene from Star Wars Episode V: The Empire Strikes Back. 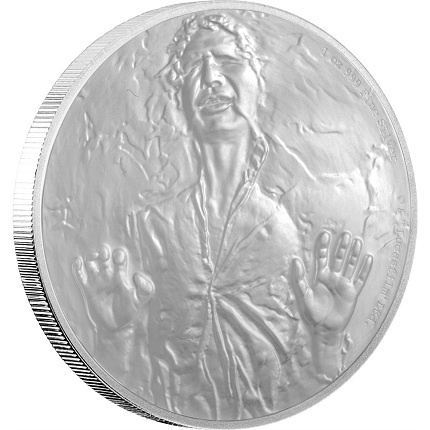 The Star Wars Classic: Han Solo design is available as a 1 oz. gold coin, a 1 oz. silver coin, and a 1/4 oz. gold coin; each coin comes with a stylized case and a certificate of authenticity. The three coins share a common design. 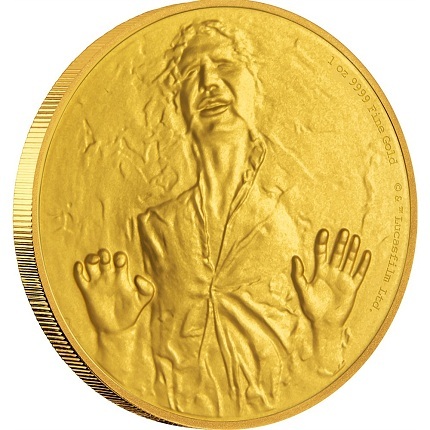 The rendering of a frozen Han Solo looks as though he is trapped inside the gold or silver of the coins. Inscribed along the rim is 1 oz 9999 FINE GOLD. The 1 oz. gold Proof coin carries a price tag of $2,500 and has a mintage limit of just 500 pieces. It is made of 99.99% pure gold, measures 32 mm in diameter, and carries a denomination of $200. The 1 oz. silver Proof coin costs $85 and has a mintage limit of 10,000 pieces. It is composed of fine silver that is 99.9% pure, measures 40 mm in diameter, and carries a monetary denomination of $2. The 1/4 oz. gold Proof coin costs $600 and has a mintage limit of 1,000. It is composed of fine gold that is 99.99% pure, measures 20 mm in diameter, and carries a denomination of $25. The obverse of each coin carries Ian Rank-Broadley’s portrait of Queen Elizabeth II, with the inscriptions ELIZABETH II, 2016, NIUE, the country of issue, and the monetary denomination. A silver kilo issue of the Darth Vader design has also been released. It has a mintage limit of 1977 and can be purchased for $1,500. For more in formation on the Star Wars Classic series, please visit the New Zealand Mint’s Web site. Which mint makes Star Wars coins, Perth MInt or New Zealand MInt? What is next coin issue for Star Wars Classsic?